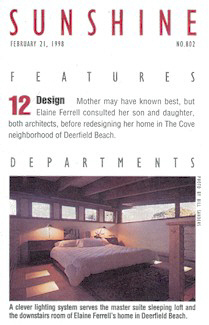 Elaine Ferrell knew exactly how she wanted to redesign her home in The Cove. And she knew two architects. If there's any doubt that mother knows best, Elaine Ferrell will dispel it. 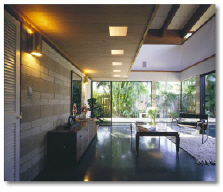 when she put an addition on her Deerfield Beach home, two of her children, who are architects, provided the design. "What's it like working for Mom?" says Wayne Ferrell, who lives and works in Deerfield Beach. " I sent her four different designs. We came to an agreement on the fifth try." Wayne's sister and partner, Stephanie Ferrell, runs the team's office in a historic building in Ybor City, near Tampa. "Mom's really a closet architect," says Stephanie, a historic-preservation specialist. "In another era, with a little bit of impetus, she would have become an architect. She's very spatially oriented." Elaine Ferrell's appreciation of architecture developed long before her children became professionals. In 1958, while her late husband, a naval-carrier pilot, remained at home in Minneapolis, Elaine visited her mother in Fort Lauderdale. the plan was for the family to settle in the area, so Ferrell went house-hunting. When she saw the house in Deerfield Beach, she bought it. 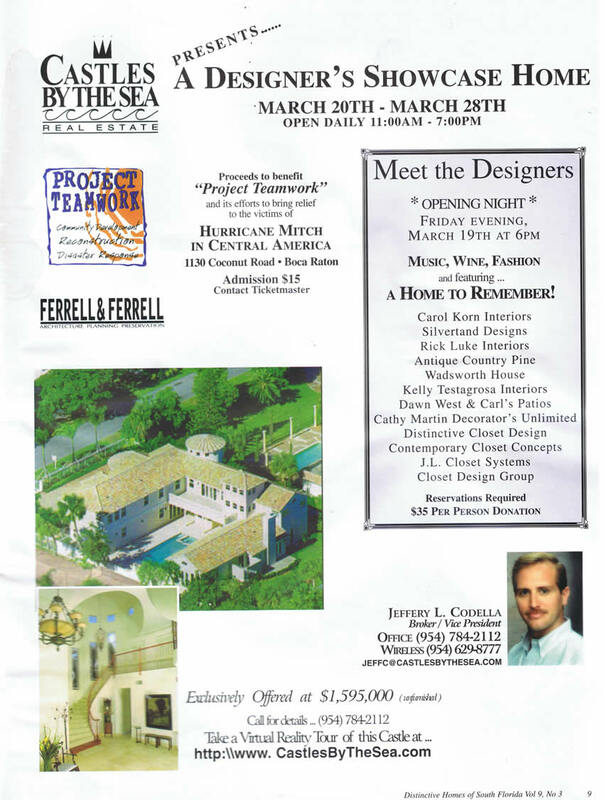 The home, located in The Cove neighborhood between Federal Highway and the Intracoastal Waterway, was a "spec" home built by a small developer named John Apetz. It was a far cry from the ubiquitous "CBS" spec houses of the time. The home's style was a major influence when it came time for Wayne to choose a career. this house," Wayne says. 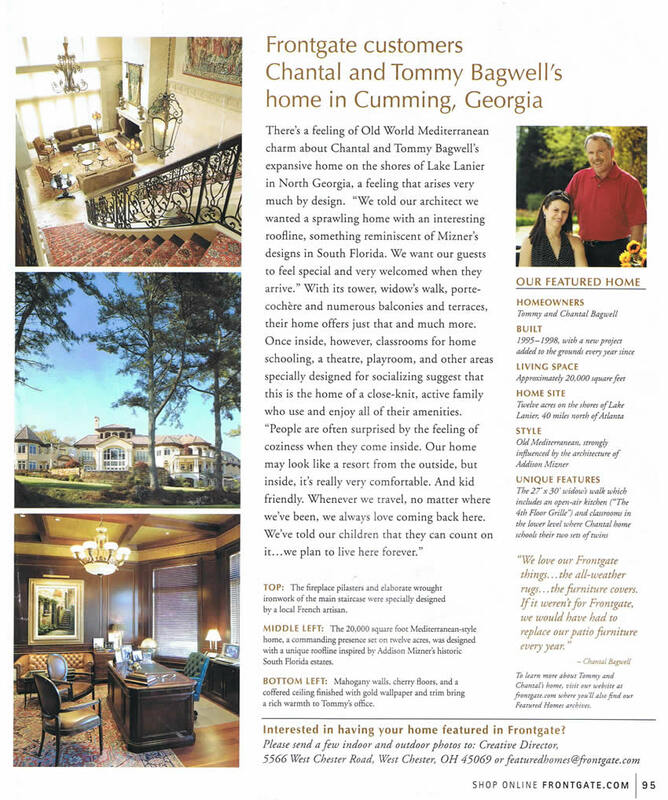 "As I grew up seeing the cathedral ceiling with beams, I noticed how the house was put together. I would go into other people's houses and think they were confusing. Everything would be covered up. But here, everything was apparent." After living in the house for eight years, Ferrell replaced the three jalousie windows in back with sliding-glass doors and added a 16-by-40-foot patio. 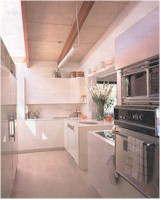 then , in 1984, she remodeled the kitchen. This time she asked Wayne and Stephanie for suggestions. Air conditioning was installed in the late '80s. but the big push came in 1992 with a new master bedroom and the addition of a pool. Ferrell turned the project over to Wayne and Stephanie, who were living in California and Tampa, respectively. 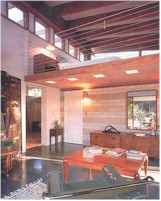 The master suite addition combined two small bedrooms and included the striking charcoal-gray lap pool and a whirpool. The Ferrells used the 36-foot-long beams of the new rooms by letting them extend through the outside to form a visual covering for the pool. "It's almost a psychological element," Wayne says. "It gives a sense of comfort. " The lap pool, or "moat," as the family refers to it, reaches almost to the back of the tropically landscaped property, so a fence was built for privacy. Ferrell wasn't done yet. In 1996 the back bedroom, formerly Wayne's, underwent a transformation. Jalousie windows were replaced with sliding-glass doors, and 10-by-10 foot Roman bathroom with granite and stained block walls took the place of the old stepdown shower. Finally, last year, a sleeping loft was introduced to the master bedroom. " I call this my work in progress," Ferrell says. " I'll probably think of something again and will add more down the road." When that time comes, Wayne and Stephanie will happily take on the design project. " She has a great eye for design," Wayne says. Adds Stephanie, " Mom doesn't pay well, but she makes up for it in appreciation." The Cove in Deerfield Beach has gotten a vote of confidence in the form of a major tenant, and the proof is in the dust rising from what has been revealed as a Chinese restaurant called Famous Door. 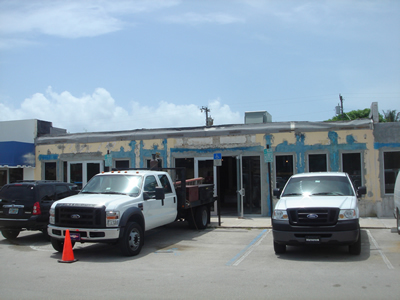 Architect Wayne Ferrell of Deerfield Beach has stripped the place down to the cement, combined it with what was formerly a trouser store, and is rearranging 6,300 square feet to accommodate a 210-seat restaurant, the vision of Silvio Trentalange. Trentalange sold a chain of 18 restaurants in Philadelphia to retire to Broken Sound five years ago. After spotting what he decided was a perfect restaurant location at The Cove, he rethought his retirement. "We need it in this area. We knew that," he said of the restaurant. 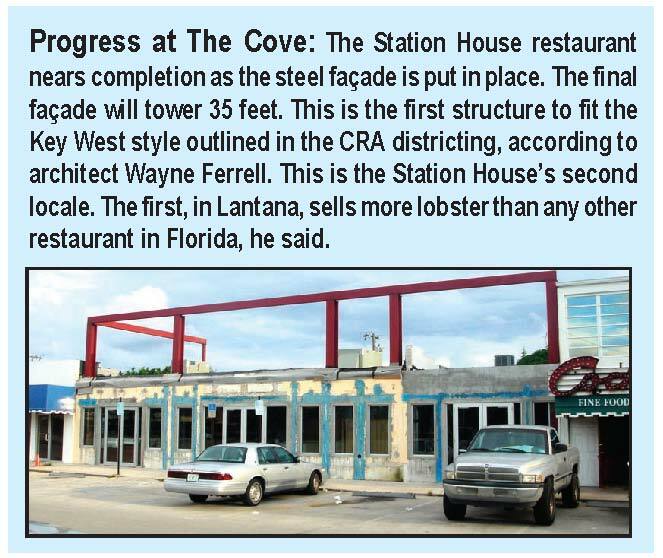 "We looked at the market research and came to the conclusion that if we find the right tenant..."
Enter Steve Jankun, owner of The Station House Restaurant and The Station Grille in Lantana. Jankun has seen his operation grow through five expansions from 70 seats in 1993 to what he says is the largest user of lobsters for a restaurant in Florida. Jankun wasn't completely sold on the concept. "I had been here 16 years. I was happy with my life. My wife is having a baby and I wasn't looking at anything," he said. "I can't tell you how many times I've been offered opportunities everywhere from Boca Raton to Jupiter and I didn't go anywhere. ... So I told my wife, 'Let's just go in and get out of here.' "
What Jankun didn't count on when he stopped by the building, which at the time housed an establishment called Café Claude, was a building shape he found captivating -- and Trentalange. "I get a lot of people from Philadelphia who know his restaurants [and] they were very well known," Jankun said. "He did it 40 years and he's a rare breed. He's somebody I admire." The deal was finalized in December. Construction began weeks later. Jankun has such great plans for the larger operation in Deerfield Beach, that he expanded his Lantana tank from 3,000 gallons to 7,000 gallons, holding 7,000 pounds, so it can supply lobster to the 1,500-gallon tank in Deerfield Beach as well. He had planned to open in next month but couldn't get approval of the variance he need until two weeks ago. Opening now is slated for April -- securing his title as the largest restaurant purveyor of lobsters in the state. "We've even bigger than the chains," he said. "Chains, most carry 1.5 pounds, run 1.25 on twins. My thing is, I've got everything from a pound to 10 pounds."